CAROCELL Direct Solar Powered Desalination Technology is one of the most efficient and cost effective product of its kind in the world. The system produces safe, high quality potable water from any water source, including, polluted, contaminated, industrial waste water, brackish ground water, saline aquifers and sea water. The system receives impure water by gravity or pump into a feeder pipe at the top of the unit. The input water slowly runs down the solar collector/evaporator being evenly dispersed. 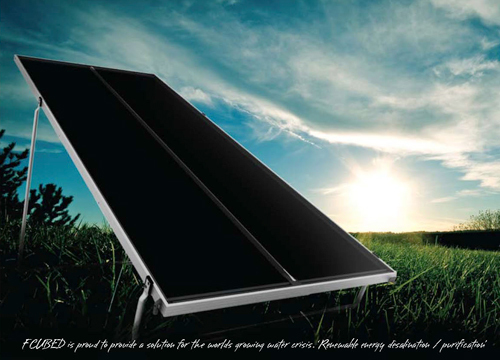 Solar energy heats the water, it vaporizes and then condenses on the inside of the composite plastic panel enclosure. Droplets of distilled water run down into a pure water outlet at the bottom of the unit. Greater efficiency of purified water output has been achieved through the unique distillation system design. The design includes composite layers of the water tight panel enclosure and the surface treatment of the solar collector. As well as allowing the moist air to circulate, producing condensate on the interior front and back surfaces of the enclosing panel. CAROCELL Direct Solar Powered Desalination Technology working at an ambient temperature heats the input water causing a vapour condensation change precluding all bacteria and pathogens, therefore eliminating waterborne diseases. Exposure to ultra violet light and extreme heat from solar energy through the advanced composite panel enhances the germ killing process. Output water through distillation is purified to a level of 0.5-2ppm of (TDS) totally dissolved solids (sea water is measured at 35,000ppm TDS). CAROCELL Solar Waterpurifiers only use the sun’s energy, there are – no moving parts, no electronics, it is robust and easy to set up, low maintenance and very low in operating costs because the waterpurifier only needs solar energy. The feed water can be supplied by gravity/pressure or pump enabling it to be completely versatile to fit within your current demand. Carocell panels are a breakthrough in Solar Desalination.